Building upon yesterday’s post, there are in our midst so many very blessed people whom the Lord reveals Himself to in very profound ways. Although not excluded from this revelation, the Lord isn’t speaking merely to the theologians, the bishops and priests, the learned among us, but often the pious person with a great and deep faith and prayer life. Blessed are those whose faith in God is strong especially in the midst of adversity and trial. Blessed are those who have little of what the world informs us we should have, who we should be and what we should do: often these are the people with the greatest faith. 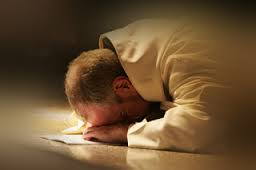 Obviously there are many days when I feel close to the Lord, if I didn’t I wouldn’t have discovered God calling me to the Roman Catholic priesthood. But there are many days when I busy myself with work I believe to be for the Lord and know that it’s just for me. That is when my brothers and sisters whom I meet at Holy Mass, who though also busy take the time to pray and spend time with the Lord first and foremost. I remember a good and holy priest told me that one of the blessings about celebrating Mass for the people and with the people is that if we pause and think about it, they model holiness for us. While we as priests sometimes have to make little effort to show up for Holy Mass, they have to make their way to the church, sometimes rising very early and they don’t always have control over the conditions of their day as we so often do. His words have always remained with me and have helped me to always appreciate the people that I serve as a priest. I share them now as Director of Vocations with the men I discern with because these are important things for these men to hear. We should never presume that while our vocational call might be to shepherd the flock in the name of the Lord, with a certain authority and sacramental powers to do so; that we are somehow expert at living the true way Christ calls us to live. If we don’t seek to take a high position of belief about ourselves, the result is a humble sense of ourselves – and this will allow us to be truly what the Lord in today’s Gospel is calling us to be.